Matrix Pest Elimination service was established in February 2000, and from the beginning, our focus has been on providing the highest levels of pest extermination service and customer satisfaction available anywhere. As a result, we have consistently maintained 95 percent account retention, well above the industry average. 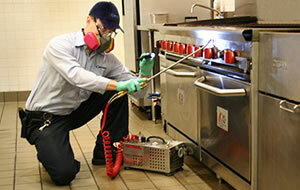 Matrix specializes in both commercial and residential pest elimination services. Unlike our competitors, our service technicians are specifically trained and equipped for pest abatement in Restaurants, Hotels, Apartment Complexes, and Health Care Facilities. We’ll also resolve all of your pest issues at your residence. The one thing that sets us apart from our competitors is our flawless service to every customer. Moreover, with the MATRIX exclusive Rapid Response Program, our response times are the fastest in the industry. We stand by our record of outstanding service and invite you to experience the difference for yourself. Please contact us with your questions about any aspect of our service. We look forward to hearing from you.